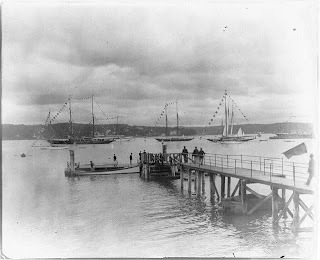 Oyster Bay Harbor as seen in 1905 from what the photograph noted was the Oyster Bay Yacht Club. It is possible this photo was taken from the shore of the Seawanhaka Yacht Club on Centre Island. Photo from the Library of Congress. Thanks Zach.This is a beautiful and haunting photo, I can get lost in it.